AnyShape - Photo Editor (iOS) ~ Android Forever! "AnyShape - Photo Editor completely revolutionizes selective editing on the go. 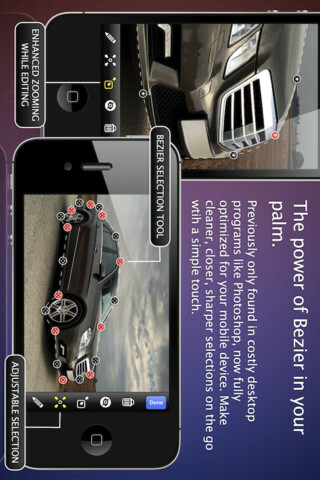 The highly effective Bezier selection tool, previously only found in costly desktop programs like Photoshop, has been fully optimized for your mobile device. This is truly unique and far superior to what's currently available on the App Store i.e. your typical finger-smudging masking tool. Now you can create just about any shape imaginable in seconds and use it for irregular shape cropping, selective filtering, and selective colorizing. But that's not all, AnyShape is a highly capable editor that can process images up to 10MP/25MB and comes equipped with 20 awesome filters and 15 professional enhancement tools. AnyShape is a fully fledged photo editor that does it all and does it all very well! From enhancing to cropping to filtering to colorizing; consider all your editing needs met!" AnyShape is currently FREE at the iTunes app store!